Now in stock, our new ISD2548 Voice Record and Playback Mini Board, this compact easy to use Voice Playback board is ideal for adding sound and voice to your projects. The unit can easily be controlled by a microcontroller and each separate message can be played as required, making the unit ideal for use as a talking clock, queue number announcements, voice warning alerts and much more. The unit is based on the popular Winbond ISD Voice Record and Playback IC's. This chip is a complete record and playback solution for recording and then reproducing the sounds based on inputs from a microcontroller. The ISD2548 includes an op-amp chip microphone preamplifier, automatic gain control, smoothing filter, speaker amplifier and high-density memory storage. The recordings are stored in nonvolatile memory cells, requiring no power to maintain the memory, the memory has a 100-year data retention period. Numerous recordings and re-writes are possible, allowing the system to be used in an answering system. 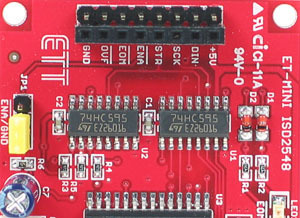 The board includes all necessary components for functioning of the unit, allowing direct connection to a microcontroller. 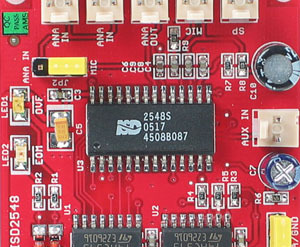 An "End of Message" (EOM) LED and "Overflow" (OVF) LED are pre-installed on the board, together with all the necessary connectors for a microphone and external speaker. The unit is powered from a standard 5V supply and requires very little current for operation. Up to 320 Messages can be addressed with a minimum record time of 150 msec, making the unit ideal for sound effects. The address of the message is sent to the unit from a microcontroller and then the unit is triggered to playback the message. Our low cost ISD2548 Voice Record and Playback Mini Board is ideal for easily adding sound and voice to your system. 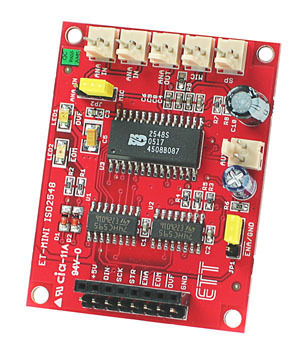 Play sound effects, voice warnings, time and number announcements easily with simple microcontroller control. The unit is compact and can easily be mounted in a standard project box.